Cathy Rush is a newly married woman who has not easily transitioned into her role as housewife and bleacher warming cheerleader for her NBA referee husband. Both Cathy and her husband have a love of basketball and as a former college basketball player, she is not satisfied with only watching from the sidelines. When the opportunity of becoming a basketball coach at the Catholic all-girls’ Immaculata College opens up, Cathy jumps at the opportunity despite opposition from her husband. It does not matter that the college offers her practically nothing in pay due to it being on the verge of bankruptcy, or that the gymnasium no longer exist due to fire, or that most of the players lack competitive basketball skills. It also does not matter that she receives minimal support from Mother St. John, the president of the college and also the person who hired her to basically be a baby sitter for these young girls. What matters is that Cathy has a dream and she realizes that unless she does everything possible to fulfill it, she will never be at peace with herself. Cathy sets her aspirations high especially since this is the first year (1971-1972) in women’s basketball that a national champion will be crowned. Immaculata Mighty Macs – National Champions…impossible, maybe, but Cathy never stops long enough to consider all of the obstacles. She pushes through coaching her team and along the way sparks a confidence in her players, garners support from the students, the nuns at the college, the community, and eventually Mother St. John who rally around these underdog basketball players. There are heart warming moments like when Cathy and the girls return from a competition, past curfew, and are confronted by Mother St. John. Cathy is immediately apologetic having already been warned about keeping the girls out past curfew. Instead of being chastised, Cathy and the team not only learn they are going to the championship but waiting to greet them is a room full of Immaculata students and faculty with congratulations. Later, following in another scene as the team is doing a photo-shoot for their new celebrity, the girls gather clothing and accessories for a fellow teammate after the photographer insist she “move to the back” because he thinks she is inappropriately dressed. You see growth in the girls who all joined the team for selfish reasons come together as a team on and off of the court. In regards to the affect her coaching has on her marriage, Cathy is reminded by her assistant coach nun to “keep her eye on the ball,” and she is not talking about basketball. Cathy is determined as a coach and we have to assume that she and her husband resolve their differences because he is later shown, in between his games, warming the bleachers and rooting her on to victory. This is an inspiring, true story of Naismith Memorial Basketball Hall of Fame inductee Cathy Rush who led The Mighty Macs of Immaculata College to three consecutive AIAW national titles (1972-1974). Also an inductee into the women’s Basketball Hall of Fame and the Philadelphia Sports Hall of Fame, Cathy far surpassed her dreams. 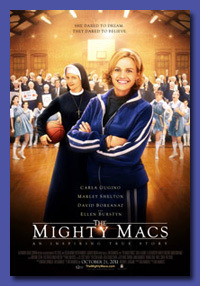 Find a theater near you where The Mighty Macs is playing. Oooo! I’m gonna have to put that in my Netflix queue. Doesn’t hurt that David Boreanaz is in it.